Blurb – The Maheshwaris are back, a little secretly this time! 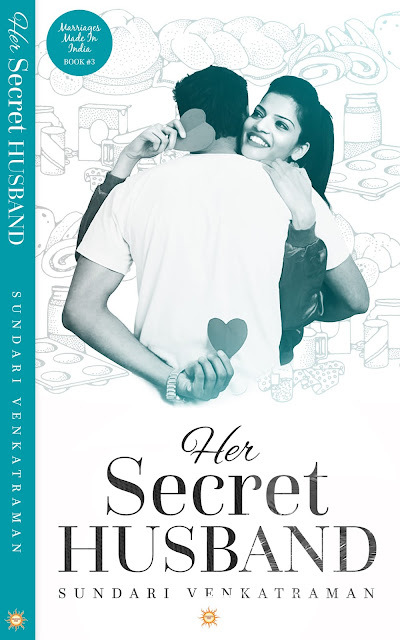 Review – The book Her Secret Husband is book 3 in the five novella series ‘Marriages Made in India’. Read the review of the book 1, The Smitten Husband and Book 2, His Drunken Wife. Having read both the books previous to this, I grabbed this book and did not waste time in reading it. The story is simple, not too complicated, but it is the narration that what makes the story so very special. The plot is between Lakshman Maheshwari and Ruma Malhotra, their love, steamy romance and how their marriage unfolds in a rather filmy style. The story got me hooked right from the start. Her Secret Husband is a story of love at first sight, developing into a romance and concluding into a marriage, not before encountering problems. Both the characters are madly in love and they do not hesitate even a minute to share their feelings with each other. At the start, both of them are slow and measured in gauging each other’s responses, but Ruma comes across the one who is ready to take the plunge and indulge in a steamy romance first. Both the characters are strong, but I liked the way Huma’s character is portrayed – Love as if there is no tomorrow and show emotions as if that’s all you know! Along with them, there are many other characters to keep the story moving forward and even they too are nicely etched, especially the role of Huma’s grandmother. She is one strong, focused and jovial person. Once again, the book is free of any editing and grammatical errors. Overall – The story in this book is high on passion and drama. So I would suggest, sit with a bowl of popcorn, switch on your air-condition to full blast and enjoy the romance. It is a must read for all the romance lovers. A quick breezy read and perfect for a lazy afternoon! So grab your copies now! PreviousMake this Holi Safe for your little ones with Rangeela!